All dance started with the yearning of the human spirit to move, but with the development of consciousness, expressed in civilisation, an additional element emerged: the idea that the purpose of human life is to grow, to evolve the consciousness, to transcend. But the makers of Indian civilisation realised that it is very difficult to develop consciousness, so they created supports and ladders that could lead to growth if they were followed in a disciplined way. All classical Indian arts are these ladders: dance, music, painting, sculpture, architecture and so on. Classical Indian dance is one of these forms. By the practice of and engagement with this form there is a possibility that transcendence will reveal itself. That doesn’t mean that everyone who practises classical Indian dance is at a higher level of consciousness. It depends on the practitioner. First of all there is an abundance of beauty: beauty in the costume, in the make-up, in the jewellery, in the movements. Why beauty? Because beauty makes the heart melt and when the heart melts it dissolves the ego, even if it is only for a moment. That moment when you look at fully bloomed flower and you smile, the ego has dissolved… then it comes back. Secondly there is the form, the movements, which consist of a highly stylised geometry. By stylised I mean that which is not mundane. So if I want to show a flower in bloom, what am I doing? I am not miming the flower. I am somewhere becoming the flower. So I am becoming one with that which is represented. But the movements are also stylised because they are very well thought out and scientific. They are “yogic”, in the sense of that which integrates or unifies. These movements are designed in such a way that when I sit in a certain geometric posture the energy circuits all link up. As a result, things will be aligned inside me and this will also have an effect on the viewer. Thirdly, there is storytelling, which is mostly about gods and goddesses. The gods and goddesses are symbolic of certain living principles, so I have to assimilate the principle which the deity represents in my own consciousness and in my own day-to-day life. The principle itself is formless. From the form I access the formless principle and bring it into form. 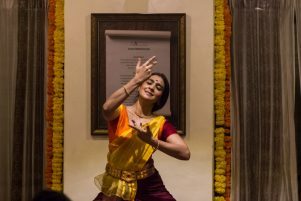 Thus the form of classical Indian dance is designed to express a certain content, which is the essence of these principles. Summing up, in classical Indian dance we have beauty, we have stylised movement and we have content. All these levels contribute to the living experience of the concept that from the formless comes the form and the form is meant to take us back to the formless. This is the crux of classicism in India.